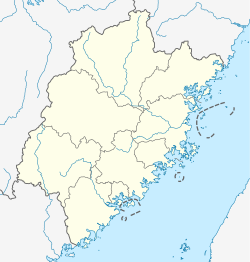 Fu'an (help·info) (Chinese: 福安市; pinyin: Fú'ān Shì; Foochow Romanized: Hók-ăng-chê; sometimes Fu An) is a county-level city of Ningde prefecture level city, in northeast Fujian province, PRC, some 150 kilometres (93 mi) away from the provincial capital Fuzhou. Fu'an is known for its tea production. One successful local company is the Tan Yang Kunfu tea, which won the Gold medal in Panama Pacific International Exposition (Year 1915). An electric motor company (MingDong Electric Motor) was in FuAn between 1970 and 1980. The company went bankrupt, but the remnants of the company set up many shops, making electric motors and pumps two of the main products in the area. One of the first Anglo-Chinese kindergartens was established in Fu An in 2002. Fu'an was created a county in 1245 AD in the Southern Song. In November 1989, FuAn was elevated to a city at county level. Fu'an is surrounded by hills and the sea. It covers an area of 67.44 square kilometres (26.04 sq mi). FuAn is located on the east or left bank of the Jiao (交溪), the main tributary of the Baima River (白马河). Fu'an is known for the Saiqi Harbour (or Baima Harbor), which also bears the name "Golden Passage". National Route 104 passes through the county-level city, connecting its centre with Ningde municipal centre to the south and with Zherong County to the northeast. Fu'an Railway Station on the Wenzhou-Fuzhou Railway, located near Wanwu Town (湾坞镇), over 30 km (19 mi) south from Fu'an's main urban area. FuAn has three street committees; the city's executive, legislature and judiciary are in Chengnan, together with its CPC and PSB branches. There is one Development zone. The city oversees eleven towns and seven townships, of which three are zoned Affirmative action-like for the She nation natives. Wikimedia Commons has media related to Fu'an.